The following morning, we headed first to Parkway Parade, a suburban shopping centre located just 8 kilometres to the east of Singapore's CBD off the Marine Paraded exit on the ECP. It comprises 6 levels of retail and an office tower with 17 levels. Parkway Parade is designed around a central mall with a number of smaller secondary malls and boasts an impressive atrium space, which filters in natural light. 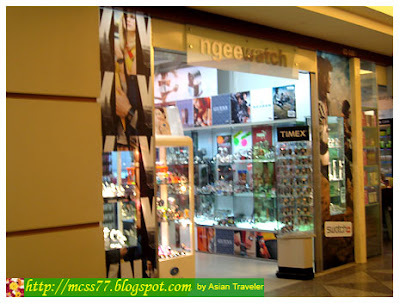 We happened to stop by at Ngee Time Gallery shop at basement 1 near the escalator. 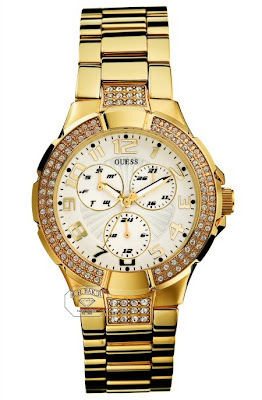 I was super elated when hubby bought me a GUESS stunning ladies gold plated fashion watch (S$ 195.00). (Yahoo! Another new addition to my watch collections.) It has set with two rows of crystal stones around the bezel and features day & date dials. It comes with the offical box and instructions and with a free Wow Pod magazine. 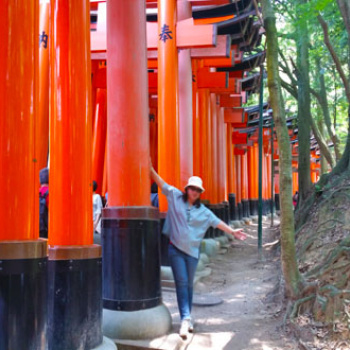 Aside from Ngee Time Gallery, there are also hundreds of stores conveniently located such as Best Denki, Giant Hypermarket, Planet Fitness, Isetan, Borders, Treats and Timezone just to name a few. At basement level, food & beverage, and eclectic specialy mix are found. Level 1 is mostly a fashion targeting young executives. Level 2 is a lifestyle, family, youth and ladies fashion. Level 3 is a value retailing, food and beverage. Level 4 is predominantly a family entertainment and services. Level 5 is mainly medical and beauty services, and Level 6 is primarily a Furniture Mall / Fitness Centre.